Our Blueberries are 100% U-pick, we do no commercial production so all of the berries on our plants are yours, no scrap picking! 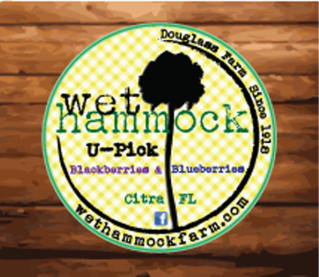 We have a whooping total of 8 varieties of southern highbush blueberries all chosen for their quality and U-Pick characteristics. Needless to say, you're not going to find these varieties at your local grocery store! Our field was planted in early 2013 and most of the plants are nearing that perfect size for picking. *Update Spring 2018- we just completed a planting of Rabbiteye Blueberries. They might be considered the 'old fashioned' blueberries that have been grown in the south for 100 years. They are heavier producers and will take our blueberry season into July! All commercial and most U-pick blueberry operations in Florida spray Hydrogen Cyanamide on their plants to induce early and more uniform ripening, unfortunately it is quite the nasty chemical for humans and the environment. We do not use such chemicals. What that means to us is a little bit later and little bit longer harvest period. What this means to you is safer and less expensive fruit! Many folks remember the days growing up harvesting blackberries in fields and in the woods. Fighting through briars and always on the lookout for snakes. These berries were usually very small due to the "wildness" of the fruit and due to the fact that they ripen in May -a time of year without much rainfall- the fruit fails to size up properly and remains very seedy. Our blackberries have been naturally bred through selection. Yes they are thornless, but this is not a GMO crop! These plants have naturally occurring genetics that prevent them from having thorns yet large and tasty fruit! The 3 varieties we currently produce are 'Natchez', 'Ouachita' and 'Osage'. Spring 2018: Our 1/2 acre orchard is near full grown now and we should have fruit ready for picking this year! We recently added a few more acres to our orchard so we will have plenty of peaches to go around! We have been growing flowers for a few years now as they are quite a big hit! We grow several varieties of sunflowers as well as many types of zinnias and marigolds. We sell them U-Pick by the mason jar, so fill them up! Please check our hours of operation, we post hours and days on Facebook as often as possible or you can call at 352-812-5462. If we pick out for the day we like to let folks know that as well. Arrive as early as possible. We are usually not open everyday, this is to allow time for more fruit to ripen. We tend to pick out relatively early in the day. We have planted more acreage due to this. Also, it gets really HOT in the middle of the day! Wear appropriate clothing for being outdoors. This includes hats, sunscreen and appropriate shoes for trampling around on a farm. Check the weather, even though its Florida and that really doesn't mean much in the summer, but we would hate for you to come out here and get washed out. We provide you with buckets to pick into and bags to take the fruit home in, but you are more than welcome to bring your own container. Due to Generally Accepted Practices (GAPs) we ask that you wash your hand before entering the fields. We have a hand washing station. We will be there to explain how and what exactly to pick, depending on the fruit. It might seem obvious but that's not always the case and we're professionals. We have many shaded areas and picnic tables, you are more than welcome to have a family picnic and enjoy mother nature! A full restroom facility is not available, however we do have portipotties and hand washing stations.